La Jolla, California - 5,025 s.f. In addition to being the architect, H2 also provided full time construction management services throughout the construction of this home via an Owner/ Builder Multiple Prime construction method. Located in a beach community this residence was transformed into a contemporary multi-level home with the ocean as the common focus. The architecture, is characterized by simplicity of materials, details and finishes. Sculpted, stucco planes with natural patina are highlighted with modular window openings. Limestone floors and clay tile roofs are accented with sandblasted beams and ceilings. Orientation and massing provides efficient warmth in the winter and cool breezes in the summer. Through alterations and additions to an existing structure, the design objective was to create a home that encouraged an open, casual lifestyle with a place of solitude for the family. This was accomplished with the addition of a series of transitional courtyards, entry, interior and pool. The main level includes the family living spaces and private bedrooms for the children. The upper split-level area containes a private master suite and study. The lower split-level is used for hobbies, exercise and a wine cellar, and a roof terrace provides a private sun deck with panoramic views and year round sunsets. Texture, space and light were joined in this home to create a sense of belonging and a constant connection to the ocean. Located on a one acre site on the bluffs in Point Loma this homes focus is the ocean to the west and the City of San Diego to the east. Sculpted plaster wall forms enclose the main house including entertainment spaces, library, a wine cellar, exercise room, master suite and guest bedrooms. An enclosed lap pool connects to the main house and overlooks the tennis court and pavilion. The guest house sets above the ten car garage and shop. The architecture is characterized by simplicity of materials, details and finishes. Sculpted, stucco wall planes with natural patina are highlighted with modular window openings. Limestone floors and clay tile roofs are accented with sandblasted beams and ceilings. With sustainability in mind the orientation and massing provides efficient warmth in the winter and cool breezes in the summer. Boulder, Colorado - 4,115 s.f. Located on a wooded property in the flatlands of Boulder Colorado this home has been expanded and remodeled to provide secluded privacy for the owners while capturing the majestic views of the Flat Iron Mountains to the east. With images of the prairie homes, the house is connected to the land with stone walls that extend from the inside out to the terraces. Long roof overhangs provide shade in the warm summer months and protection from the winter weather. Natural light floods the home through clerestory windows. The plan revolves around the “great room” with each space and room connected. Terraces expand the home to the outdoors and give each room its own private exterior space. The new second level provides a large private master suite with a sitting room, library, master bath and terraces to the east and west. La Jolla, California - 4,500 s.f. Located above Windansea Beach this residence was transformed into a contemporary multi-level beach cottage. The owner’s lifestyle encouraged a casual, open plan that would promote a comfortable, livable beach home. Art, music and lighting gave direction to the design and plan. Outdoor terraces and pool areas became living areas connecting to the indoors. The architecture incorporates traditional materials of wood lapped siding, painted brick and cedar shingles blended in a “white on white” palate familiar in the beach community. Pyramid shaped trellised flagstone terraced encourages the indoor/outdoor living. Skylights bring in natural light and an aquarium suggests images of the ocean. The interior design takes advantage of a soft background palate and a sculptured architectural space. A combination of white textures was added along with the repetition of the exterior floral jewel tones. Individual furniture items were influenced by the owner’s art collection, which was whimsical yet sophisticated. The ocean became the ultimate focal point and all incorporating the ever-changing horizon. Coronado, California - 3,400 s.f. This two story, 3,400 s.f. home was designed in the context of the island community with board and bat siding, white trim and a white picket fence. The ground floor living spaces, connected by hardwood flooring consist of a great room, dining room and kitchen open to a private courtyard. A roof top terrace with panoramic views to the City of San Diego and the bay provide additional outdoor entertaining space. Point Loma, California - 4,250 s.f. In addition to being the architect, H2 also provided full time Construction Management services for the construction of this home through an Owner/ Builder Multiple Prime construction method. Located in a harbor side community, this 1950’s residence with panoramic views of the harbor and city beyond, sits among other traditional style homes in this neighborhood, with the harbor and city views as their common focus. Through alterations, additions and extensive restoration to the existing structure, the design objective was to maintain the general floor plan relationships and create a home that encourages a casual lifestyle for large gatherings, as well as a place of solitude for the family. The Cap Cod Architecture and nautical theme is characterized by lap siding, copper trim, extensive glass doors and windows, traditional white trim and gray slate roof. Interiors are highlighted with hardwood maple floors, Honduran mahogany stair rails and sandblasted fir ceilings. Flagstone decks are accented with Honduran mahogany and stainless steel handrails. Orientation provides efficient warmth in the winter and cool breezes in the summer. Del Mar, California - 4,500 s.f. Located on the bluffs above the Torrey Pines Lagoon and beach this three story home, accessed through its curving stairway, has panoramic views from all levels to the lagoon and the Pacific Ocean. This modern home with its white plastered walls and curving solar shading element retains a strong sense of warmth and livability through the use of the wood flooring, soft plaster finishes, wood cabinetry and space relationships. The two story volumes allow light to diffuse through the home via clerestory windows and skylights. Exterior terraces from each level transition the living area to the outside. Sustainability and energy conscious design was considered from the early planning including site orientation, long strategically placed overhangs, and material/equipment selections. La Jolla, California - 3,500 s.f. Located one block from La Jolla Shores beach with panoramic views of the shores, La Jolla cove and Mount Soledad this beach home, through its courtyard plan and warm wood detailing and sculpted plaster materials, provides a secluded retreat for the owners. The home was designed as a progression of public and private courtyards, from the entry, through the living space and into the pool yard. White plaster masses contrast with the use of simple, natural accents of wood, glass and Saltillo tile. All of the wood in the home, including the beams, the windows and the cabinets are of vertical grain douglas fir that has been either sandblasted or oiled. The interior space is naturally lighted with clerestory windows and skylights. The home revolves around the open kitchen and “great room” plan providing a casual lifestyle. A roof terrace provides a private sun deck with panoramic views and year round sunsets. Sustainability and energy conscious design was considered from the early planning including site orientation, long strategically placed overhangs, deep recessed plaster wall openings and material/equipment selections. Coronado, California - 2,400 s.f. Designed on 25’ wide by 140’ deep lots in this beach community, these homes meet the strict Coronado design guidelines for floor area and building massing. 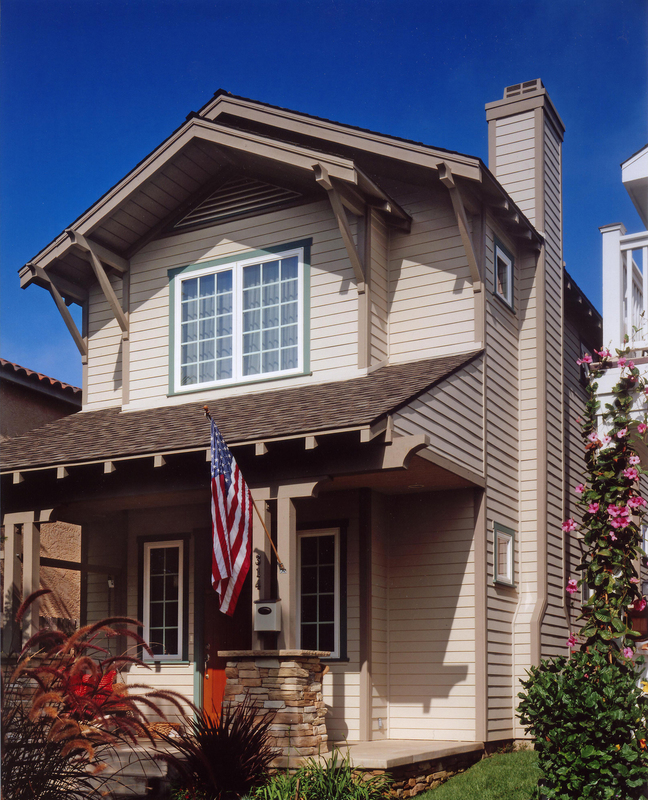 One home is designed with a “white on white” beach cottage theme and the other home is finished with natural “craftsman” materials and colors. 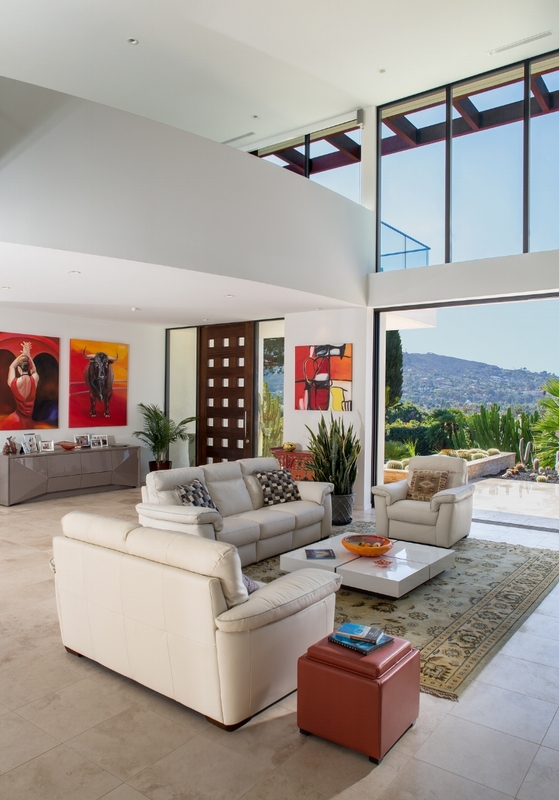 Each home has a roof top terrace with panoramic views to the City of San Diego and the bay. La Jolla, California - 6,000 s.f. 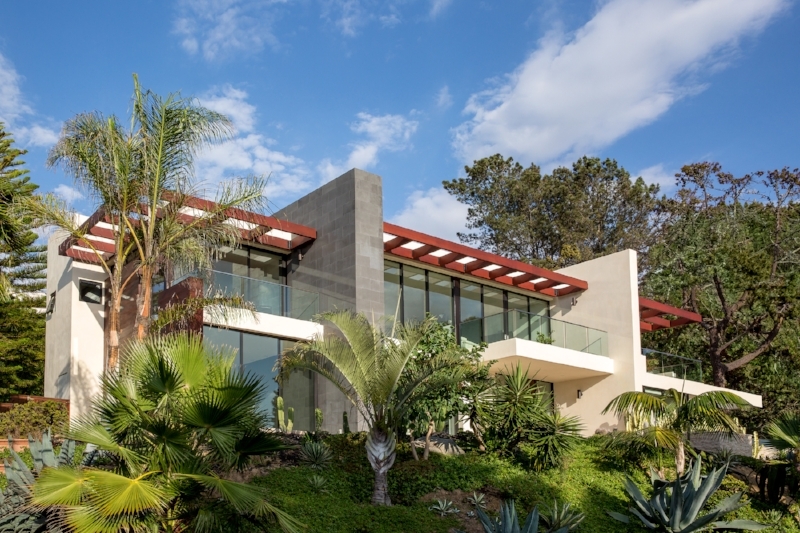 Located on a coastal bluff with panoramic views of the ocean, this beach home, through its courtyard plan, warm wood detailing with stone and plaster massing, provides a secluded retreat for the owners. Planned to provide a casual lifestyle for the client, the home is a progression of public and private courtyards all designed with an orientation to the ocean; from the entry court, through the living space, which revolves around a two-story “great room”, to the open kitchen and out to the pool court. A roof terrace provides year round sunsets. Sandstone site walls and alabaster plaster masses contrast with the use of simple, natural accents of wood, and bush hammered basalt stone on the fireplace mass. The interior space is daylighted with floor-to-ceilings windows accented with mahogany wood frames and well-placed overhangs. Dual glazed windows reduce heat gain from the afternoon sun and allow soft, diffused light into the home while minimizing the need for artificial lighting. Sustainability and energy conscious design were considered from the early planning to reduce the impact on the site and the environment. Sensitive site design and building orientation, photo-voltaic roof panels, durable renewable building materials and finishes, Energy-Star rated appliances and water conservation strategies will all be incorporated into the design.